Luis was an awesome instructor. The views are spectacular, as well he really does provide you a plethora of knowledge on the local history and wildlife. If you can afford the time, go for the full day tour. The meal provided was better then most of the restaurants I visited during my stay. If you have a sense of adventure, you can not skip out on this. I am definitely going back for more. This smaller, family-owned company was awesome! 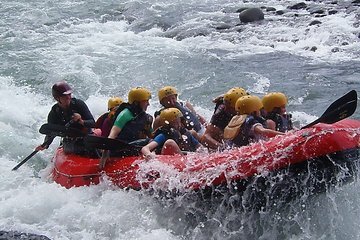 We were two families with a range of rafting experience and we decided to do the full day Class III/IV. David, Stanley, and Tonio (two of whom grew up on the Sarapiqui) were our guides and they were fantastic! i can't recommend them highly enough.